A venerated venue in Selly Oak, as Mike has written in, it needed its own page. Hi – we need a page for the above as this was a major local venue. Rock Against Racism had regular slots there showcasing local punk and reggae bands. They also used to have great sound systems on plus there was always a really great atmosphere. There was a large room upstairs and the small cellar bar which was a great place. Dangerous Girls played there a lot as did the Suburban Studs. Here & Now – now that was weird plus the Scent Organs (Duranies drummer was in them), Rudy & the Rationals also. As ever, please help us build up a list of gigs at the venue, send in flyers, tickets, posters, photos and everything else! 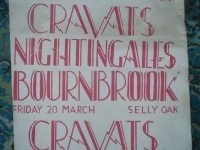 Here is the poster from The Cravats and The Nightingales gig at Bournbrook. 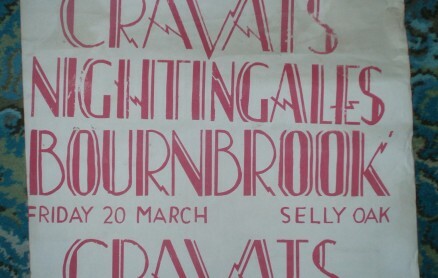 Used to love the Bournbrook. Up and coming student bands would play in the basement and more established bands upstairs. I remember seeing the Au Pairs, I think Fashion and a really god local reggae band called Mosiah. Loads and loads though. Used to get a mixture of bikers, punks and general locals in the main bar downstairs, I don’t think the students used it much when it was the Bournbrook. It used to kick off in there on Saturday nights in more ways than one. Which is probably why they sanitised it, gave it a major refurbishment and turned it The Varsity. 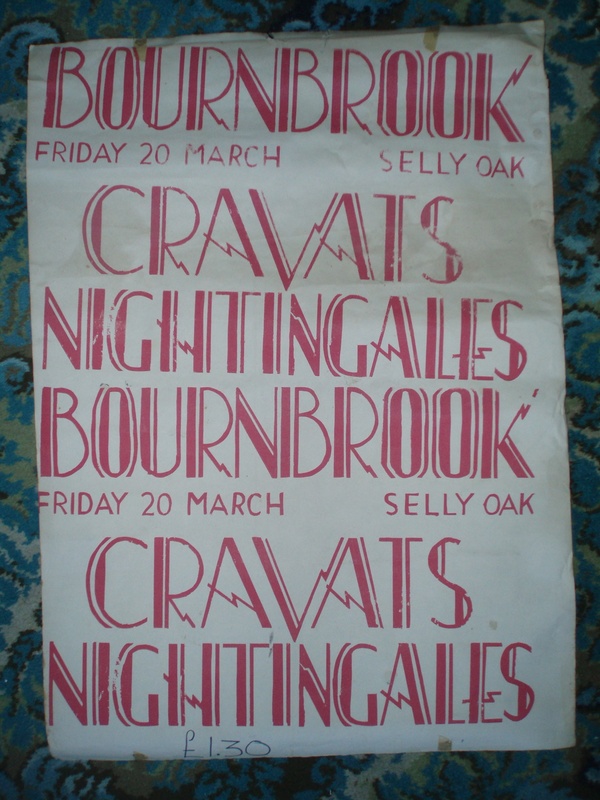 Was a brilliant place for bands though on our side of the city, along with The Junction in Harborne and the Breedon in Stirchley. On Sunday nights around 1969 there was a folk club in the cellar bar…called Cellar Folk. The compere and resident artiste was an unknown called Jasper Carrott! Always wondered what became of him! Jasper ran it with his mate George. The guy on the door taking the money was Steve Tyler. When Jasper left he was replaced by Ian Highfield. He knew two songs one of which was Scarbrough Fair…..and the second one was! OMG one of my posters! I remember designing that- I took the lettering from a lettering book and cut the stencil with a medical scalpel. I only had a small silk screen them so it was a tight fit on the paper. I was running out of blue ink, which some of the first batch were printed in and mixed it with red to eke it out and got that lovely rose colour. I’m trying to remember the gigs we put on there, the stage was frightful, shaped a horn for acoustic amplification which freaked out the sound engineers.